* as a quick note, I have written a bunch of these, and then didn't have the energy to go and take a photo to go along, so they never got posted. This was a lame selfie, and I hope to do better at the end of this week... but I thought it would be fun to share an update whether the photo is lousy or not. This mark felt like a big milestone. Every week that I am still pregnant is a good thing with these babies. Premature labor is pretty common for twin pregnancies, and comes with a lot of risks. Each week that I get to check off is less time they will hopefully have to spend in the NICU (we, like all parents, are hoping for no time at all), more time they have to develop on their own, and gain weight (which means better eating, better sleeping, and healthier, typically). A friend from church is a retired NICU nurse, and she said if I can make it to 35 weeks, I should be okay to deliver at any point. There are no guarantees, of course, which is becoming the norm for this pregnancy, but I have a much better chance of taking my babies home with me if they make it to that point. That is in 3 weeks, which is super hard for me to believe. And I am getting super excited. When I first found out that we were having twins, I felt super overwhelmed. I try to roll with the punches as they come, in life, but it felt like way more than I could handle. Especially since we just moved, Adam started a new job, and we are now living in a large house, vs a small apartment with way more cleaning and responsibilities inside and out. Also, Adam works quite far away from where we are currently living, so that is a concern that we will continue to look into as these babies are born and grow. I have finished most of the important stuff that needed to get done like sponsored projects, grocery essentials run, Fox's room projects and washing baby clothes, so I am hoping to take it pretty easy the next couple weeks, to try to delay delivery as long as possible. As for how I am feeling currently, emotions are running a little higher than usual, as I am trying to balance the stress of knowing they might come early if I do too much, but feeling the pressure to get stuff done before they come. It is a tricky balance. Thankfully, I haven't cried too much. The occasional breakdown, but feeling relatively sane for how pregnant I am. When I went in for my last growth ultrasound (3 weeks ago), the tech said that the babies were measuring around 3 pounds each, which felt so big, but we are hoping they will be around 5 or 6 pounds when they are born, so I feel like we are already doing pretty well! And one last thing, it is amazing how my clothes are fitting. Clothes that were fine a week or so ago are suddenly way too small! 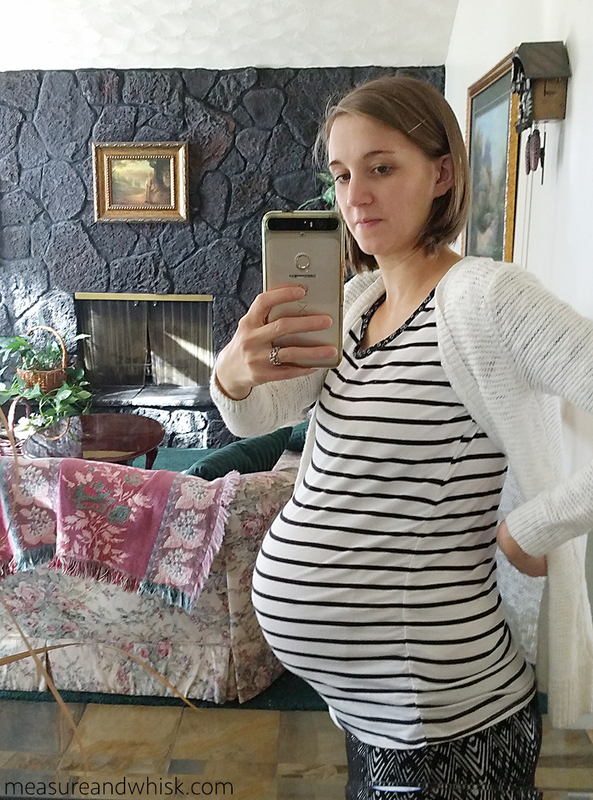 My belly is just getting huge, and pretty soon, I will be wearing tunics and dresses exclusively, because none of my shirts will be long enough! I kid you not. I will make sure to document the hugeness, so we can all be astonished together! Good luck mama! I just had a baby (he's four months old) at 35 weeks because I went into labor (we moved...I probably did too much) and he was a healthy 6 pounds and no NICU stay. I know twins are very different but I just wanted to give you some comfort and confidence! You got this! Just try to remind yourself that most projects can wait. You really do look lovely! Praying that those babies stay put for as long as possible!